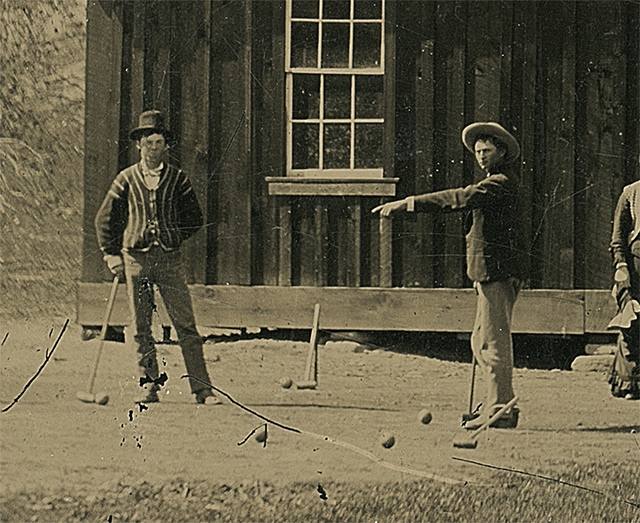 A photo bought at a junk shop in the USA for $2 five years ago has been insured for $5m, after experts said it shows legendary gunman Billy the Kid playing croquet. The photo, bought at a junk shop in Fresno, California, in 2010, is a 4x5in tintype that shows Billy the Kid and fellow members of his gang The Regulators. It was taken in the late summer of 1878, according to Kagin’s auction house, which has valued the photo and put it up for sale. ‘When we first saw the photograph, we were understandably sceptical – an original Billy the Kid photo is the Holy Grail of Western Americana,’ said Kagin’s senior numismatist, David McCarthy. ‘We had to be certain that we could answer and verify where, when, how and why this photograph was taken. ‘Simple resemblance is not enough in a case like this – a team of experts had to be assembled to address each and every detail in the photo to ensure that nothing was out of place. Kagin’s said the only other known photo of Billy the Kid is a portrait of the famous outlaw taken in 1880, which sold for $2.3m in 2010.